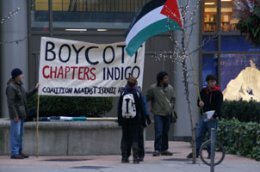 Report on a Canadian initiated boycott against Chapters and Indigo Bookstores - their President/CEO/Major shareholder is funding the Israeli military. 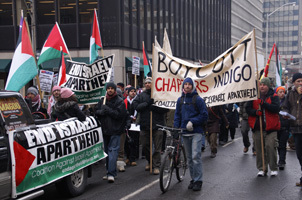 All the material here has been taken from the Coalition Against Israeli Apartheid (caiaweb.org) leaflets on the subject - slightly modified to include the launch by "Boycott Israeli Apartheid Campaign" of a picket outside Chapters Bookstore in Vancouver on 12 May 2007. 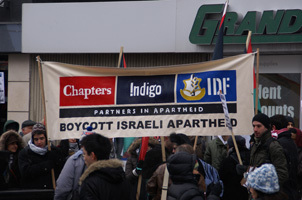 The majority shareholders of Chapters and Indigo Bookstores, Heather Reisman and Gerry Schwartz, established a fund called Heseg – Foundation for Lone Soldiers – a program of financial support for former “lone soldiers’ in the Israeli military. The Israeli military is responsible for war crimes in the West Bank, Gaza Strip, and Lebanon. 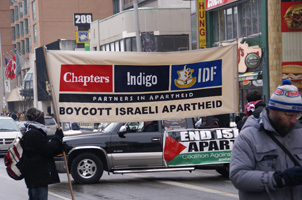 Do not buy any products from Indigo, Chapters, World’s Biggest Bookstore, SmithBooks, Coles, The Book Company or Indigospirit until their controlling owners publicly announce that they will cut all financial ties to Heseg – the Foundation for Lone Soliders. This report was conducted and produced by Mostafa Henaway of ckut 903 fm in montreal, and CKLN 881FM in Toronto. 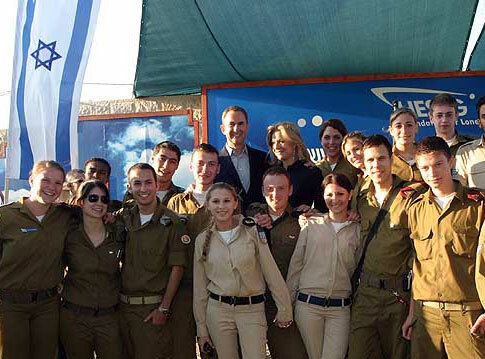 Many members of the Heseg Board are high-ranking Israeli military personnel. 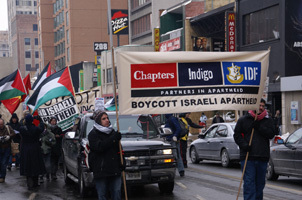 This includes Doron Almog, who avoided arrest in London last year by refusing to disembark from his plane because of a warrant issued for his arrest on suspicion of war crimes..
Heather Reisman and Gerry Schwartz own or control over 68 percent of the shares in Indigo Books and Music Inc. which owns and operates bookstores under the names Indigo, Chapters, World’s Biggest Bookstore, SmithBooks, Coles, The Book Company or Indigospirit. Reisman is chair and CEO of Indigo Books and Music Inc.
What is the Foundation for Lone Soldiers? These are individuals who have no family in Israel but decide to join the Israeli military. As Israeli soldiers, they participate in a military that operates checkpoints that restrict Palestinian freedom of movement, enforces the occupation of Palestinian land, and has a documented history of human rights violations. At any time there might be 5,000 ‘Lone Soldiers’ in the Israeli military in all capacities including in combat units. What is the Purpose of the HESEG Foundation for Lone Soldiers? In explaining how Reisman and Schwartz support the IDF through the HESEG foundation Israeli Defense Minister Shaul Mofaz said at the first Heseg Foundation Grants Awards Ceremony in 2005 that “Encouraging and supporting young individuals from abroad” who have become lone soldiers “directly supports the morale of the IDF”. Who is on the Board of HESEG Foundation for Lone Soldiers? 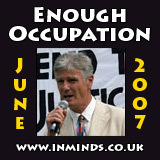 avoided arrest in London in 2005 on suspicion of war crimes. “The former head of Israeli forces in the Gaza Strip said Monday he was warned by diplomats not to leave an aircraft that had landed in London after a tip-off that British police were waiting to arrest him on war crimes charges”. Almog was in charge of the Israeli military southern command when a one-ton bomb was dropped on a house in Gaza killing 14 civilians nine of them children. Currently the International Chairman of the “Association for the Wellbeing of Israel’s Soldiers” (AWIS). 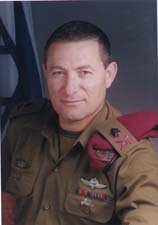 Chief Commander of the Israeli military in Gaza Strip and West Bank, and Head (GOC) of the IDF Central Command during the years 2000-2003. Head of the marksmanship and sharpshooters section of the IDF. 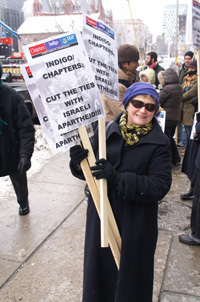 Heather Reisman: President and CEO of Indigo Books and Music Inc.
Indigo Chapters: Cut the ties with Israeli Apartheid! 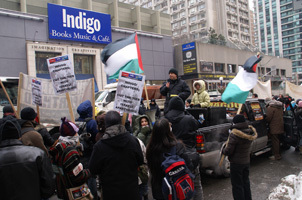 Tell friends and relatives not to shop at Chapters/Indigo. Encourage them to support independent book retailers. Write/fax/phone a protest to the board of Indigos/Chapters demanding a public renunciation of Reisman’s and Schwartz’s financial support of the Heseg Foundation for Lone Soldiers. Photo-report of the fortnightly picket outside the Natural History Museum to protest against Veolia's sponsorship of the Museums Wildlife Photographery Exhibition. Veolia is complicit in Israel's occupation of Palestinian land. Photo report of protest against Veolia sponsorship of exhibition at Natural History Museum, also look at the route of Jerusalem Light Rail and Veolia's complicity in the Israeli occupation. Photo report of protest againt Veolia's sponsorship of the Wildlife Photographer of the Year 2011 exhibition at the Natural History Museum. Veolia is complicit in Israels occupation of the West Bank. The Dump Veolia Campaign lead a demonstration outside the Natural History Museum to protest against Veolia's sponsorship of an exhibition at the museum. Veolia is complicit in Israel's war crimes with its support of the settlements. "The truth is this is not really an occupation of the West Bank at all, its colonisation - aggressive on going colonisation! There are now nearly half a million permanent settlers in the West Bank. Pristine hill top settlements are omnipresent and canonise the West Bank. What’s more they breed yet more electric fences, moats, Jew-only roads, road-blocks, checkpoints, soldiers - over 500 of them. Imagine if this situation was reversed, if it was the Palestinians doing this to the Jews would the reaction of this government and the world be the same? I don't think so."